« Coinstar to Offer Cosmetics Kiosks? (R)editorial: How Often Do You Redbox? By offering cheap, convenient DVD rentals from kiosks across the country, Coinstar has helped make the verb “Redbox” part of the cultural lexicon. 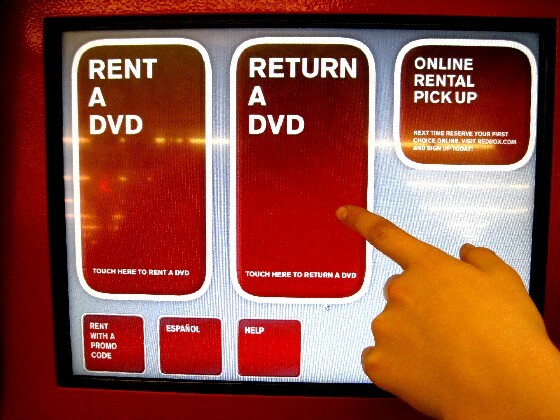 For millions of Americans over the last few years, “Let’s Redbox,” has become a common statement. Since this blog is largely read by people who like to Redbox (along with a few haters), we thought it would be interesting to see just how often the Insiders are Redboxing. Our in-house team of demographics experts has come up with the following list of categories describing those who Redbox. Read through them, and then hit the comments and let us know where you fit. You know exactly what new and windowed releases are coming out and have a standing appointment with the Redbox employee who stocks your local kiosk each week. Eight or more rentals per month. You loves you some movies, but you save most of your Redboxing for Friday and/or Saturday nights. Four to seven rentals per month. You dig Redboxing, but there’s more to life than just cheap DVD rentals. Two to three rentals per month. Your frugality knows no bounds, and you only Redbox when a new code comes around. Approximately one rental per month. Once a quarter or so there’s a movie worth Redboxing. Three to eleven rentals per year. Your local Redbox kiosk and your dentist receive about the same number of annual visits from you. Two or fewer rentals per year. Fewer than one rental per year. Let us know where you fit. Of, if you do not fit any of these categories, feel free to add one of your own! Definitely the Tuesday Night Stalwart!! I’m a dabbler. I look every week for the new movies, but they go fast. I’d do more if I had more RB’s to choose from in my town. Ann try reserving them online at http://www.redbox.com (I think) and then you can have a better chance of getting the movie you want. If you do not pick it up they will still charge you though. The dabbler. We also like to purchase videos from the RedBoxes that allow us. I’m a sporadicus. I only rent when I can get a free code and remember to go before it expires, but since I don’t have texting, I miss out on the monthly code and don’t rent enough to be an opportunist. Those who loiter around, not one but several kiosks, shaking and sweating profusely hoping that “The Opportunist” Insiders will show up and share their promo codes, allowing the BOXJUNKIE to get his or her fix–on a daily basis ;). I am SEMI-annualist which is TWICE a year. The Biannualist is every OTHER year! You beat me to the punch by one minute, RB. Mr. Merriam and Mr. Webster politely disagree with you: http://www.merriam-webster.com/dictionary/biannual. I think you mean “biennial”. In fairness I stand corrected. Anyway, I am still a SEMI-annualist ;)! Either twice weekly or every other week. I’m a dabbler. There are few new releases that I want to see. I usually get those with Redbox and I use my Netflix for tv series discs and older movies that aren’t available on Watch Instantly. opportunist with red … Tuesday Night Stalwart with bb express! now that red has blu-ray things might change. depends on how many bd disks get released each week on avg. and when bb express starts withg bd too. btw if you sign up with a new account and rent online with red you can get your movies at 1/2 price. and if you do the same with blue … as i do … i get all my movies for free! 2 at a time 1 you pay for one is free! Definitely a Weekender! No time during the week and it makes for cheap date nights with my hubby. I’m The Opportunist, but for the last few months I’ve been skipping RedBox in favor of going to my public library. More title selections and 3 weeks of time. Only con is they don’t have new releases. I rent weekly, not usually the weekend though. I have never gotten the free codes to work. More often than not, I fit in the “dabbler” category – mostly because I split my frugality between the inexpensive Redbox movies and the taxpayer-paid movies from the local library. I rent, through the week and weekends. It’s a cheap way to enjoy what just left the movies, where you pay much more. Used to use Redbox, now that they only offer OLD movies I don’t bother. Signed up to Netflix after they changed their offerings and primarily use Blockbuster for anything new. Sporadicus,,I wish they had more movies to pick from! I look at what is in the Red Box every time I go to the grocery store, but seldom find anything that is of interest. Looks like Hollywood has stopped making good movies, or maybe HBO and Netflix have exclusive rights to distribute, and Red Box gets the leftover B movies that HBO and Netflix do not want. The last 5 that I have rented from Red Box have turned out to be major disappointments! At least I know not to buy those titles! And DVDPlay kiosks are the same way! Are there ANY good DVDs out there that these 2 companies can start stocking in their machines? I used to purely be The Opportunist, but now that the local ones have Blu, I am a DVD Opportunist and a Blu-ray Dabbler. Biannualist. It’s really a rare occasion that I find a movie I’d want to watch being offered by Redbox. I’m a weekender, thought I don’t mainly rent on the weekends. Weekender here and only if Netflix has the movie on long wait…. Reserve after midnight on Monday night online from a previously prepared list of new releases. Look at the coming soon list at Red Box website, then look up the movies at IMDB to determine what I want. Rent 3-5 movies every week. Also use Netflix to pick up the ones I miss at Red Box. Dabbler+ (some months). My most convenient Redbox is out of the movie I want just about every time I go. Which is frustrating and gets me discouraged about renting for awhile. We are weekenders for a cheap date night after the little one is in bed, though now that our kiddo is old enough to watch animated movies we will rent occasional ones during the week. I’ll start renting from Redbox when Blu-ray is available locally (Twin Cities). I rent movies from Redbox 2-3 times per week depending on availability. Since the inception of Redbox I have rented about 350 movies. I love it…it is easy,inexpensive,and there are an increasing amount of locations plus you can reserve movies ahead of time. Redbox also gives you free movies occasionally. Don’t rent as many as I used to since the last 2 times I couldn’t return my discs to the Redbox where I rented it and so had to go out of my way to return them. The Dabbler, as of right now, but that can change depending on the time of year and of course what is going on in my life. Weekender! (Though I rent on other nights too!) : ) Love Redbox!